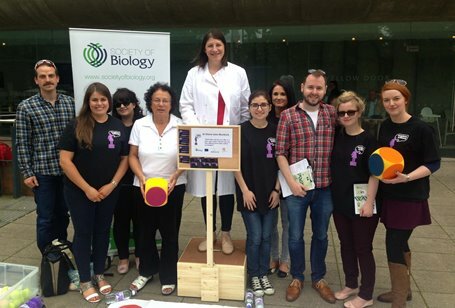 Dr Diane Lees Murdock CBiol MRSB, lecturer in biomedical sciences at Ulster University participated in Soapbox Science, a festival celebrating eminent women scientists from the UK and Ireland. Soapbox Science Belfast 2015 speakers. 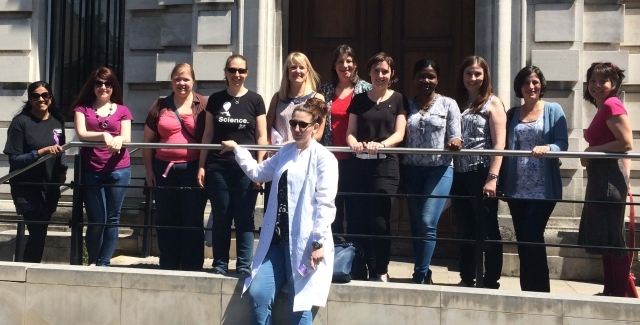 Women scientists from across Ireland join the festival of science to celebrate women in STEM. Glorious sunshine bathed the steps of Belfast’s Ulster Museum and Botanic Gardens where 12 women scientists from across Ireland attracted an audience of over 2,000 eager participants on a warm June afternoon. The scientists covered a wide variety of topics such as magnetism, cancer treatments, nutrition and personal data usage. Dr Diana Lees is a principal investigator in the Epigenetics Research Group at Ulster and course director where she developed and leads the innovative fully online postgraduate stem cell biology certificate/diploma. She brought stem cell science to the Irish public by playing an interactive stem cell floormat game, kindly provided by Eurostemcell. People had to start off life as a stem cell and compete with other contestants to become differentiated into a variety of mature cells as quickly as possible. She used the game to illustrate important concepts such as self-replication, differentiation, transcription factors and reprogramming as well as to introduce the research on stem cell epigenetics which takes place in her lab at Ulster’s Biomedical Sciences Research Institute. Diane’s participation in Soapbox Science was sponsored by The Royal Society of Biology (along with Eurostemcell and NERC), and RSB NI branch committee members Professor Stephanie McKeown (chairperson) and Jonathan Shields (secretary) joined Diane and her colleagues from Ulster University who came along to the event as volunteers to help record statistics and engage the public. Everyone agreed that their experience of sharing science with the public was very rewarding and they all had a great day out. Pictured with Diane (centre) are NI branch RSB representatives and volunteers from Ulster University. From left: Jonathan Shields (NI Branch Secretary), Seona Lynch, Sarah-Jayne Mackin, Prof Stephanie McKeown (NI Branch Chairperson), Dr Diane Lees-Murdock, Justine Beaumont, Rachelle Irwin, Dr Kevin Lagan (Randox Biosciences), Dr Karla O’Neill and Dr Michelle Rudden. Diane said: “It has been a wonderful experience getting members of the public interested in stem cell science. We have had such a diverse audience from the young to the old and they have all had great fun learning and seemed to enjoy asking questions in such a relaxed setting. I would like to thank the Royal Society of Biology for sponsoring my participation in this event and supporting me in promoting women in science”. 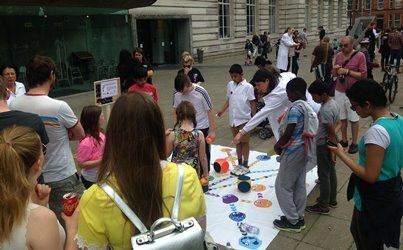 The Royal Society of Biology sponsored Dr Diane Lees-Murdock’s participation in Soapbox Belfast 2015, as part of the Regional Grant Scheme.